Love the way the light is shining through the trees. Sorry your backpack didn't stay safe up there. Thanks for visiting me today! I hope you'll come back and enter in my giveaway that starts on Sunday. Those are both cool shots. I love the sun shining through the trees. Thanks...I was taking the picture of the sunrise and the pack happened to be in it. My sweetie said that was unfortunate but I sort of like it. 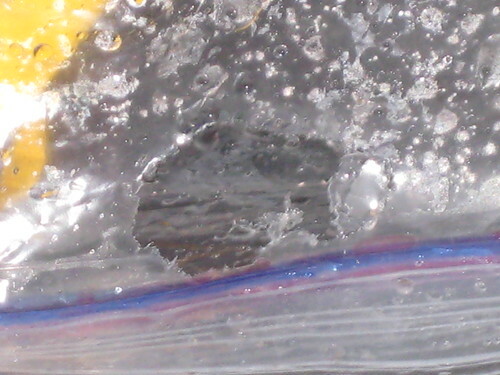 Those darn little chipmunks chewed through every single ziplock I brought - and didn't even eat the food! "micro bears" LOL! Looks like a lovely place to camp, though. Thanks for stopping by my blog. I didn't realize strings was a theme coming up. I hope you don't mind but I put your blog link in the url area so others could find your post since I have the links in the post section turned off on my blog. 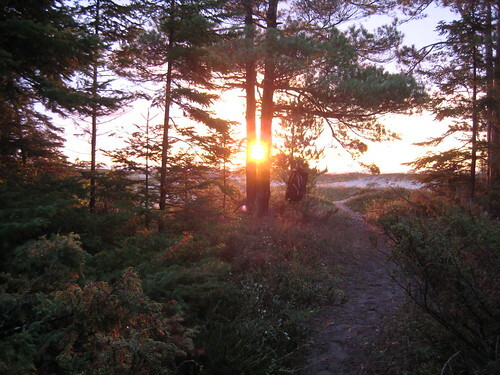 That was on South Manitou Island in Lake Michigan (off Sleeping Bear). At least it was our last night... It was a very good trip. Finicky eaters, lol... great shot, though! The sun is just "hanging" in the sky, too!